The Methodist Church in Dursley has its origins with Gabriel Hale, a member of the Tabernacle congregation who listened to the message of a Wesleyan preacher at Kingswood in 1798 and returned inspired. This led to the formation of a likeminded group of believers who met at Hale's house in Stancombe before moving into Dursley where they rented a building in Woodmancote. Within a few years the congregation built up, aided by visits by other Wesleyan preachers of the time, including Rev. Thomas Taylor and Rev. William Myles. However the group received an ultimatim from Rev. Joseph Bradford, a companion of John Wesley, who told them that if they didn't form a society then their preacher would be withdrawn. With this in mind the premises of a bankrupt trader were bought and licensed for worship in 1799. This original warehouse was extensively rebuilt in 1802 when it was converted into a spacious chapel. The church and its congregation continued to be subject to periods of growth and decline, especially during the first half of the 19th century when several other chapels started up in the area. 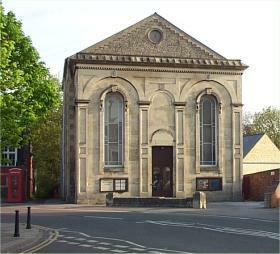 However from 1834 or so, there began a period of revival, the old chapel was renovated in 1840 and was eventually replaced in 1864 by the current building which was constructed on the same site, a prominent one right in the centre of the town. The first organ was installed in 1865 and this survives to this day, although it was extensively rebuilt in 1989 and returned to use following a period of disrepair. Looking forward, from 2003, the church certainly seems to have a bright future.